Okay friends, the bathrooms in this house have had me freaking out for weeks. Seriously, I can’t seem to make a decision and stick with it – it’s driving me crazy! Here’s the problem – typically we spring for custom vanities and they can be whatever/however we want them to be, but this time we decided from the outset that we wanted to try out the Godmorgon vanities from Ikea for all of the bathrooms – they’re an insanely great price, they have wonderful reviews, tons of storage, and they look pretty darn good. The trouble is, while the Godmorgon worked flawlessly when the “crisp & light” design scheme I’m having a hard time making it work with my “rustic modern” design (click here to see the mood board). I think they have the best chance of working with the design, and to me they look the nicest. However, all of the light fixtures in the house are black, which can work with these options, but it’s just a little tricky. The black paired with the white or white oak maybe reads a bit more Scandinavian than I’d intended. (Translation – does it look too cold?) A darker stain on the wood option would really warm things up, but I’m not a huge fan of the darker Godmorgon vanity (I’m not sure it looks as nice). 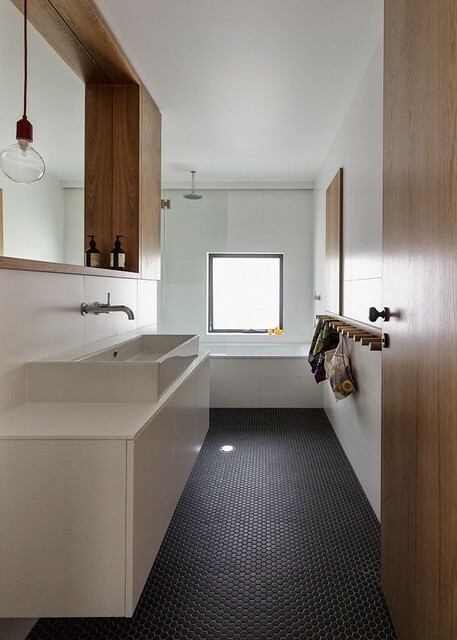 It might be possible to paint the vanities, but I’m not really wanting to add that expense and I’m not sure how paint would adhere to the vanity material. What’s a girl to do? 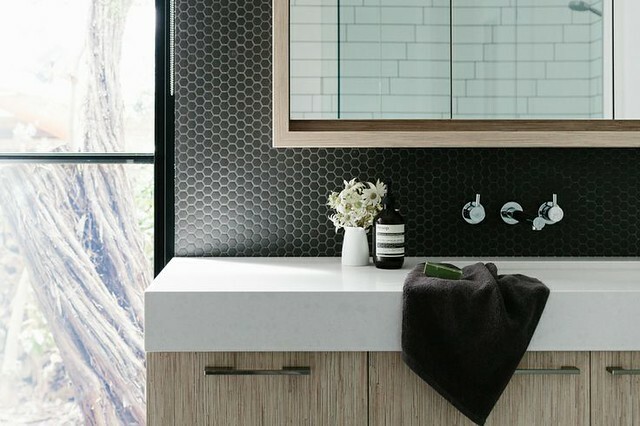 If I go with white vanities then I can add darker, warmer wood accents – or I can go with the oak and try to add lots of interest and texture with the tile, like honeycomb, contrasting grout, etc. 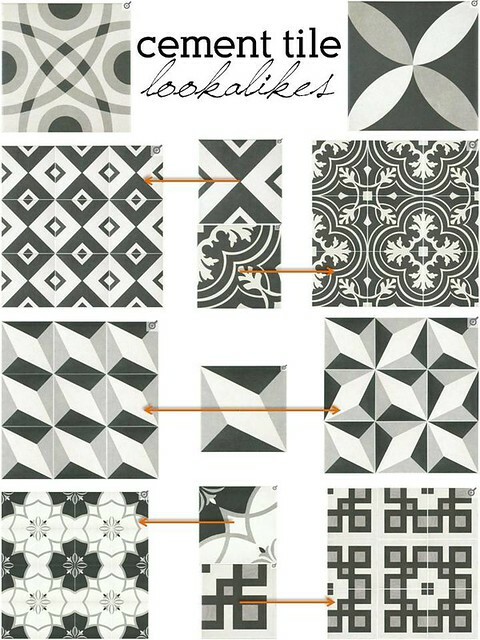 There’s a line of insanely awesome tiles at Home Depot right now that look like cement tiles, but that might be a bit too out there for a flip. Does this rambling post give you any idea of how jumbled my brain is right now? 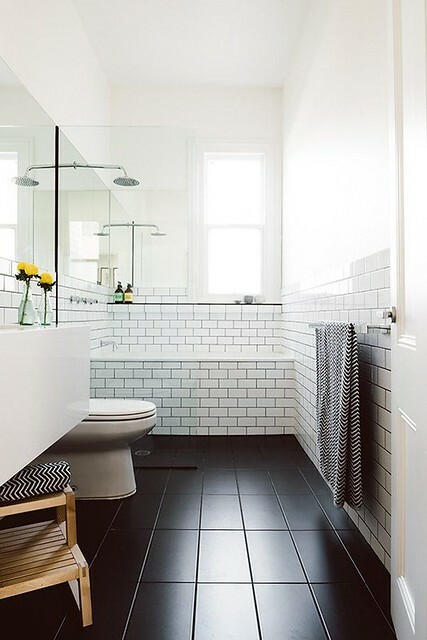 :) It would probably make life a lot easier if I would just spring for polished chrome light fixtures instead of black, but for some reason I’m feeling like it might be weird if every fixture in the house is black except for in the bathroom. Then again, maybe it’s weird to have polished chrome plumbing fixtures and black light fixtures? 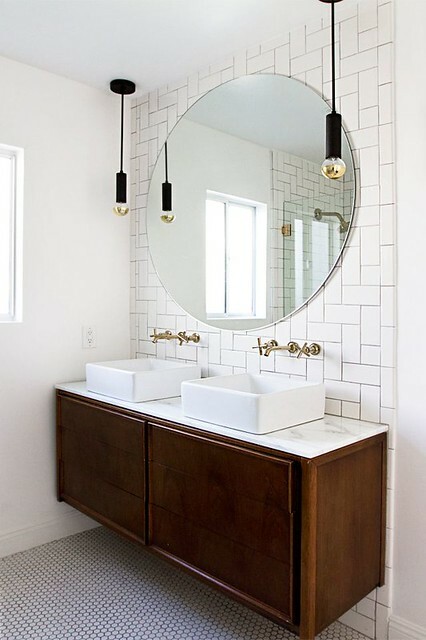 I’m thinking about doing this vanity in my upcoming reno… but I’ll probably do custom faces from Semihandmade to make it exactly what I want… Can’t wait to see how this turns out for you! I like the Hare Klein option the best. You can still do the all white vanity but that wood ledge really warms it up. Maybe find a more raw rustic looking piece of wood? If your floor plan allows, you could repeat the wood in the room with some floating shelves? Or stage it with some other wooden accessories? I vote for the white vanity!! White is classic and clean. You can never go wrong with white and you can add color with everything else. We did all oil rubbed bronze fixtures and drawer pulls in our kitchen/baths and all of our light fixtures are brushed nickle. I think as long as you keep everything consistant it works. I am super picky about details and I think we are doing a fantastic job! 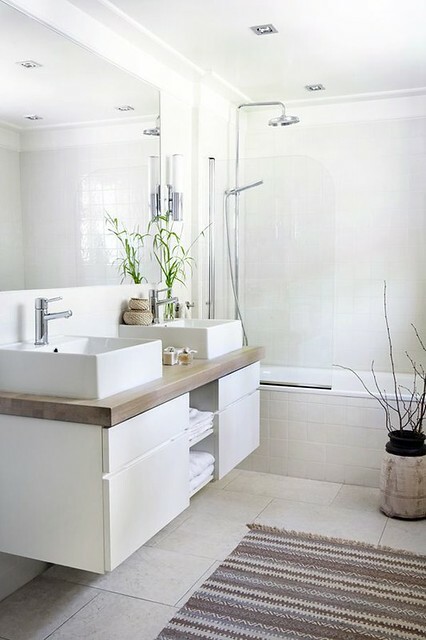 The white vanity with the wood mirror vanity and white walls I love #1 picture. Also the wood vanity with the white and black accents #5 picture. Both of those have the perfect amount of each component. The diamond tile will be the perfect mix of old and new. Only wish that bathroom would magically appear for me with matching kitchen. Love what you have done so far! Hey Sara! 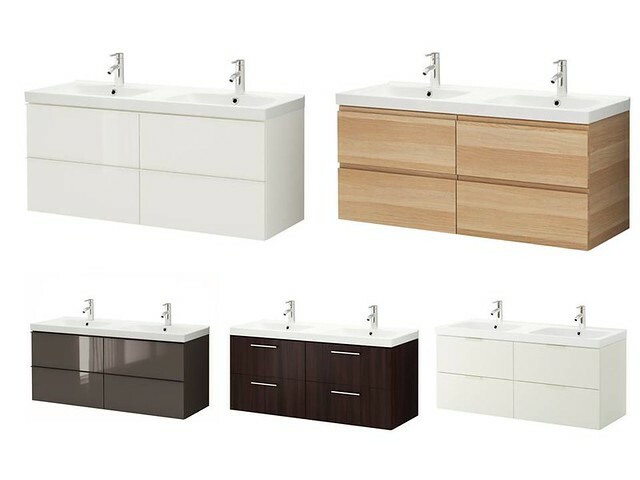 I have seen them in person – hmm, that does concern me that the white oak one looks cheap to you! I’m going to have to think on this one! As I am planning with general renovation, I think I’d go for this idea. I love the bathroom and its exquisite design. Elegant and I love it. With darker wood shelf, black lights/accents the white could look good? Or maybe I am waaayyyy off. 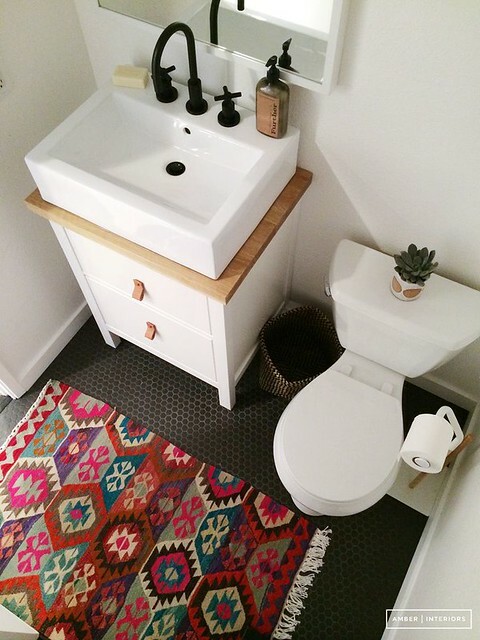 :) Oh, what about a cool wood looking tile in a warm brown with the white vanity?? OK, this may be strange, but it seems you’re doing black and white, right? Why not gray gloss? Gray, black and white certainly go together and it wouldn’t matter whether you use brass or polished nickel, or whatever with that…IMO anyway! I agree with Deb above. Love the cement tiles too. I rarely comment but I love your blog and look forward to your posts!! I love those cement tiles and have been looking for EXACTLY that in a less expensive version than encaustic tiles. THANK YOU from the bottom of my heart. Please keep sharing! I already showed my bath progress to you (https://www.facebook.com/photo.php?fbid=10152722944223960&set=a.428710578959.201188.577453959&type=1&theater). In person I liked the dark wood best, and I love Scandinavian, so that isn’t a bad thing for me. Right now mine is cold, but I’m hoping once I’m done it will be less so. I just want to chime in and say that I knew exactly what blogs you were going to cite as inspiration before you actually cited them. I just want to throw a little ‘caution’ in there and advise that you pull back and make choices that fit in the space that you’re rehabbing and also connect to you and your potential buyers. I also am a big fan of the amber/daniel/anna/emily look, but don’t lose your own gut. It’s a good one. 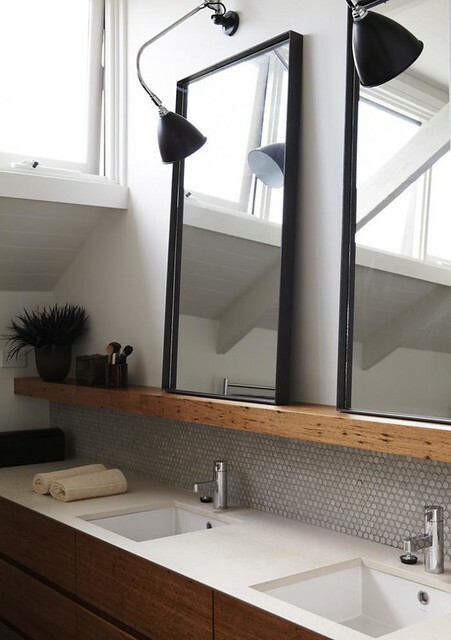 Have you thought about doing the white but doing actual cement countertops on it to give it that rustic modern look. 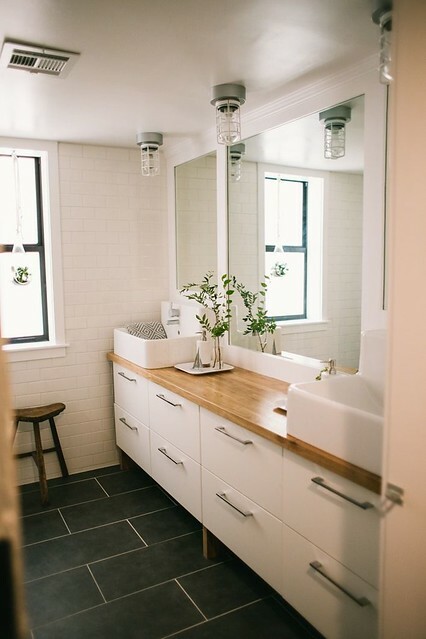 I’m using the white oak vanity in a current rehab, but I’m going for a spa look that involves a lot of white, gray, and chrome. I think it will work less well with the overall look that you’re going for. I think you can make the white work, as with the “paired with wood and a little industry” examples you picked. However, I think you’ll feel a lot less like you’re swimming upstream if you do either the dark brown (but I agree it’s the least… classy finish) or the polished grey. You can tame the latter with your fun tiles, and/or by pairing it with a mix of weathered and finished textures to bring out your industrial theme — maybe you could even use some tiles with a weathered-board look (like those below); am liking that idea more and more, even if you stick with the white! These are awesome, thank you!!! Is painting the cabinets an option? I think that white counters with weathered gray cabinets would warm the space up a bit and give it more of the rustic feel you’re going for. I love ceramic in bathrooms. You mentioned wood that feels like ceramic, I would definitely go that route. Also keeping the cabinets a blackish/grey would be a great option as well. 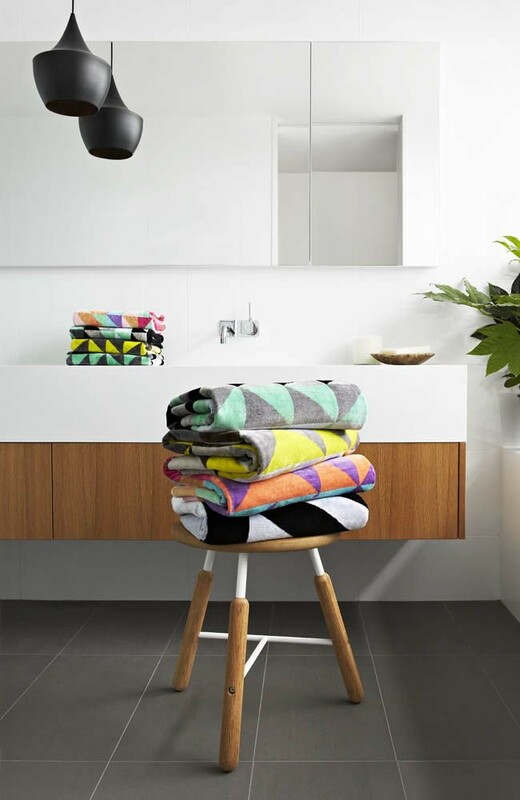 Ouuu…i love this bathroom designs. Wood looks so beauty!